We know The Burren is gorgeous to look at but did you know that some of our best food produce is made on our beautiful wind-swept west coast? Forkful are huge fans of The Burren Smokehouse and their Burren Smoked Irish Organic Salmon. A family-run business, The Burren Smokehouse was set up in 1989 by Birgitta and Peter Curtin and they’ve been smoking up some of Ireland’s best organic smoked salmon ever since. You can buy their produce online but you’ll also find it in lovely food shops around the country such as Sheridan’s Cheesmongers nationwide, Fallon & Byrne in Dublin and Ardkeen’s in Waterford. The Burren Smokehouse have a visitor centre too if you fancy going west for a visit. Find out more about their visitor centre and stockists at http://www.burrensmokehouse.ie/. These dainty little beauties can be prepared a few hours in advance and fried off when you’re ready to serve. They’re pretty good cold too and they’d make a memorable start to a weekend brunch. 1. It’s always good to use cold and leftover mashed potatoes for potato cakes (it helps them stick together) but you can start by peeling and boiling your spuds until soft. Mash them up really well and let them cool completely before you add the other ingredients. 2. Put your cold mashed potatoes into a large mixing bowl. 3. Use a fine grater to add the lemon zest to the potatoes. 4. Pick the leaves from the thyme sprigs and add to the potatoes. 5. Add a good pinch of salt and pepper to the potatoes. 6. Add the flour and mix everything together really well. 7. Use your hands to form 12 small balls from the potato mixture. Flatten them out in the palm of your hands and set aside, covered, until you’re ready to fry them. 8. Add a knob of butter and a drizzle of oil to a large non-stick frying pan. Melt over a medium heat before cooking the mini potato cakes for about 5 minutes on each side, until beautifully golden. Transfer to a serving plate. 9. 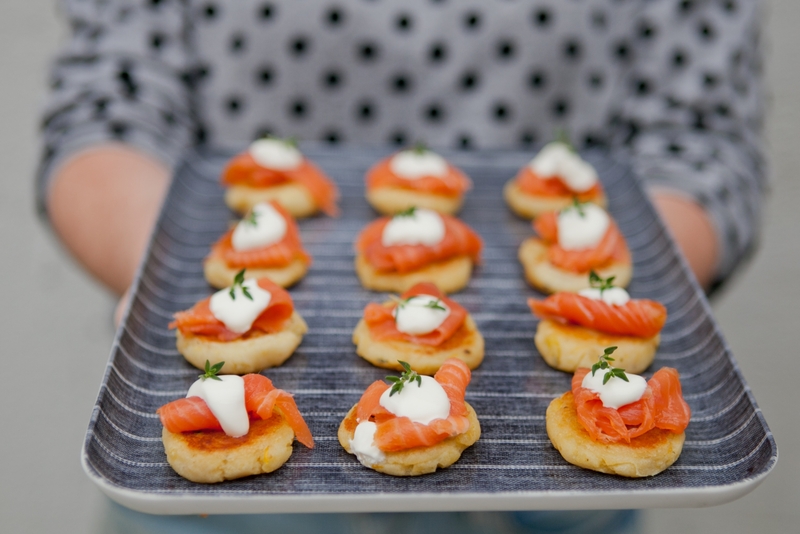 Top each potato cake with a sliver of smoked salmon, a teaspoon of crème fraiche and top with a tiny thyme sprig. Delicious.